Donna Masini, winner of the Barnard Women Poets Prize as well as a Pushcart Prize, experiments with form and with figures of speech. She writes a nervous albeit self-possessed poetic line, a line that is sometimes long, sometimes short, often irregular, but always exacting and almost always unwaveringly to the point. 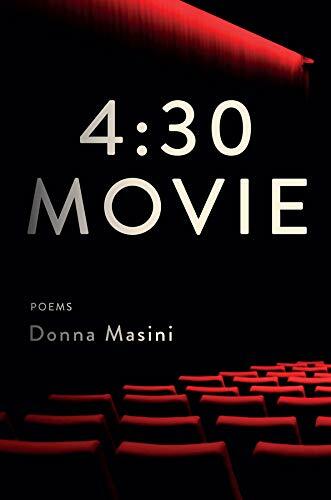 In 4:30 Movie, Masini’s third poetry collection, she uses seemingly every flexible line variant—and trope—in her remarkably adroit poetic tool bag to track her sister’s death from lung cancer, mortality in Masini’s hands playing metaphorical tenor to the vehicle of the motion picture, replete with all of that medium’s elusive temporality. While Masini makes frequent use of the more standard horizontal extended metaphor throughout this collection, for this particular poem and some others she uses a kind of metaphorical verticality, a depth-trope. Her fascination with anagrams seems to be an extension of Masini’s drive to vertically probe—in fact to vivisect—the trope. The poem “Anxieties” is an excellent example with couplets like, “West, east/their little axes//hack and tease./Your sins. Your back taxes.//.” Even rhyme is subsumed in this depth-oriented wordplay, everything becoming a tool for constructing (and/or deconstructing) everything else. While there is always a risk that too much wordplay might tend to foreground itself, thereby becoming interruptive to the poem, Masini’s work rarely falls prey to this. In “The Lights Go Down at the Angelika,” Masini addresses “this burden of being watcher and screen/and what floats across it . . . ,” in this instance, the trope re-subsuming not only its own terms, but the reader (or in this case the watcher) as well. There is a sister’s devotion in these poems, in the attempt to probe the dying and the death that in the end, Masini can only witness. Here again, of course, is the ubiquitous movie—the film, the story—that is subject to its own ground, an alternate reality that translates life and projects it back to us in our own flickering, uncertain light. How deep should she go in this endeavor? We are all “. . . suspended/in a kind of protoplasmic limbo Dante knew something about./” (“Storylines”). That limbo rescreens its terror in commercial-sized shots, our universe a series of inexplicably violent equations set apparently on automatic rewind. Mid-book, a series of nine water-lily poems with their short lines irregularly spliced across the pages comprise an almost cinematic mélange combining ekphrastic Monet with Masini’s New York where her “…sister lies/in a tangle of wires/and sweat/” (“Water Lilies 2”). The stark, random-appearing white space in this section is wrenchingly illustrative of Masini’s impending loss. Throughout the volume, poem-sections are separated by a blank page with a lone semicolon. In the poem “My Child,” Masini says that she sometimes speaks to the child she has never had in semicolons, that enigmatic punctuation mark, both comma and period, that is written like a Greek question mark, Masini in this instance taking wordplay even more deeply—to the level of punctuation-play. More longing. More absence. Masini continues to probe and mine her tropes, the semicolon in this instance graduating to the status of symbol as the work of the poems progresses. The poem, “Scary Movie,” offers an encapsulated view of history—the poet’s dreams placed in a time warp to provide contexuality, the poet’s guilt at a childhood argument with her sister a recognition of her own humanity, a confirmation that you cannot undo the past, now or ever. Masini has a gift for developing the deep trope. And a great love for her sister. Combine the two, and the result is a brilliantly moving book.